« Twisted QUAD ( and NOT “Pair” ) ! Diodes often produce switching noise. Within the context of a rectifier bridge, when a diode is in conduction mode, the p-n juntion is forward biased. The junction has a certain inherent “capacitance”, a result of a specific grouping of electrons and holes that actually polarize the junction and keep it in the “conductive” state. When the sine passes zero, and the voltages “turn” … what happens then ? One could think that the diode instantaneously ceases conduction, as it is now polarized in a reverse bias fashion. Not quite so. For a very very small amount of time, although the voltage has changed direction, but the junction still holds that grouping of electrons and holes that are polarizing it into a conductive state. So essentially, what happens is this: for a very brief period of time, the diode actually CONDUCTS in reverse directions. As this “reverse direction current” flows, it quickly re-charges, or re-polarizes the p-n junction, by sucking out the respective electrons from the one side, and pumping them in from the other. But this actually IS current conduction in the reverse direction. And then, suddenly .. WHAM ! The junction becomes reverse-polarized. And closes up. But this closing up happens very rapidly, whilst a reverse current is already “flowing”. So, a nasty spike results. A very steep spike, which essentially, in the frequency domain, constitutes a vast myriad of high frequency noise. A switching diode generates noise. Now, what do we do to “flatten out” noise ? We let it pass through a low-pass filter, such as those typical “Series_R_or_L and shunt_C” arrangements, typical of power supply filters. But what if we use exactly the “same concept” superimposed on a noisy diode ? Let us treat a diode as a source of high frequency noise. In order to get rid of that, we should now feed this noise, via a resistor and/or an inductance, and then shunt it, prior routing the signal to the load. But what is the “load” for a diode? Simply speaking, the “rest of the world”. Here we essentially treat the two connector pins J10 and J11 of the diode as a connection to the load, i.e. to the “Rest of the World”. So, if we want to “protect” the “Rest of the World” from this noise, originating from diode D8, we need to low-pass filter the source of the noise. At best with a regular CRC filter, or even better, with a CLC filter. So what are we doing here ? We are treating the diode D8 as a noise generator. 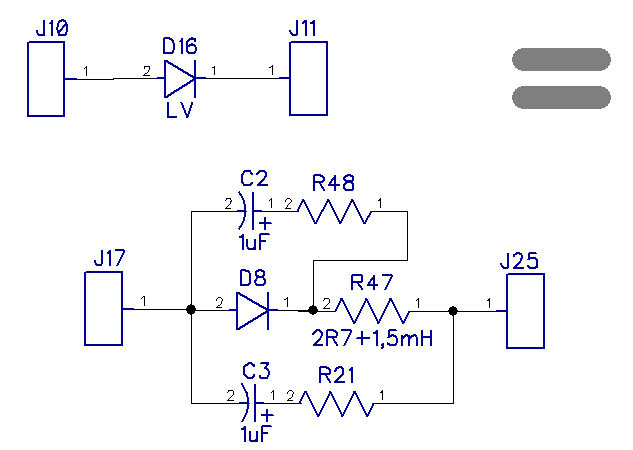 This noise generator is shunted to ground, directly on the input of the CRLC filter, by the input capacitor C2. The capacitor is of a slightly exaggerated (but effective) capacity. In order to limit the inrush currents and protect it from overheating, some people also give a damping resistor in series with it, like the R48. After the “input capacitor” of the filter, we may want to route the signal from the noise generator by a series resistance, or a series inductance, or both. Actually, I use these mini chokes wound on ferrite cups. They have a series resistance of 2,7 ohms and 1,5 mH of inductance. Actually, they also have a fair share of current handling capability. After this series element, there is the second stage capacitor of our CRLC filter, the C3 with its snubber R21. personally, in low voltage, high current applications, I would simply skip the snubber transistors altogether. So, in essence, we have hence created an extremely low pass filtered diode. But what about a High Voltage version of the same ? This is in essence a series connection of three filtered diodes. Why series connection ? If I am to rectify 1000 Volts AC, then obviously, at the output of a CRC power supply filter I would obtain SQRT(2) times more voltage, i.e. 1410 Volts DC. But what does that actually mean in terms of the voltage rating of the diode that I need to use ? Simple: your diode needs to withstand at least 3000 Volts. Think about it. At the positive peak of the 1000 V AC (rms) sine wave, as read off the label on your transformer, you are actually experiencing SQRT(2) times more. This is reflected by the CRC filter shaving the peaks of such a sine wave and producing 1410V DC on the output. But what happens when the sine reverses ? It goes all the way down to the opposite peak. Yes, you got that right. That opposite peak is also SQRT(2) bigger than the RMS value of the voltage. But it is of the OPPOSITE sign. So. bear with me now. The Caps in the PS filter are “holding” PLUS 1400V DC on their positive taps. This is the voltage seen on the cathode of the diode. But the anode of the diode sees (in reverse bias mode) a dip as deep as to -1400 V peak. Essentially, it sees the full peak-to-peak value of the sine wave upon its terminals. And that is 2 x SQRT(2) = 2 x 1,4142… = 2,8283…. So, indeed, it is almost THREE times higher a voltage than the one you “read” on the label of your transformer. This is the reason, why I use 3 series connected diodes, each rated for 1000V DC. BTW, the capacitors ALSO need to be rated for at least 1000 V DC each. I am “hoping” that the voltage will split evenly upon such a string of reverse biased diodes. But “hope” is an ill advisor. Bear in mind that the diodes may have different values of leakage currents in the reverse direction. A different “reverse_bias_resistance” of sorts. They may also have different values of the reverse-biased junction capacitance of their p-n junctions. So, not trusting my “hope” too much, I need to create a definitive guarantee, that the reverse voltage will definitely “split” into three equally valued parts. This applies to both the DC voltage component, which i split by a normal resistor divider network, consisting of EQUAL VALUED (!!!!) resistors R22, R25 and R28. The values of the resistance of these resistors is to be chosen such, that the current flowing through them is at least 3 to 5 times larger than the worst case anticipated leakage current of the worst possible diode within the string. It is the resistors that need to “DOMINATE” and set the tone in terms of voltage division, and not the diodes. So, a significant portion of the reverse current needs to flow through the resistors, and not the diodes. But this also applies to the AC “voltage spikes” that are a result of the WHAM !!! effect of the diodes closing up their reverse conduction when going into reverse bias mode. Each diode may have a different value of the p-n junction reverse bias capacitance. Each may switch at different moments in time. Therefore, apart the resistor divider network, we also use EQUAL VALUED capacitors, the shunt capacitors. These perform a dual function here. First of all, they snub the noise, keeping each individual diode QUIET. But secondly, they create an EQUAL VALUED CAPACITOR divider network, one that essentially swamps the small little capacitances hidden in the diodes themselves. So, now we are reasonably safe. We can use the very common, lousy and noisy 1n4007 diodes, rated up to 1000V each, make a string out of them, and essentially use these very cheap and popular diodes to create a high quality, low noise rectifier. A bit of a hassle, a myriad of additional elements, but the sound of music, as opposed to the sound of noise, of your resulting audio device, will be that much cleaner. P.S. For the full blown extremists (which, I also happen to be), this is a full blown version of the HV diode, expanded in such a way so that each of the individual diodes has it’s full CRLC filter. Oh, and one more thing. If the C7, C9, or C10 capacitors overheat and blow up sky high, that would suggest that their charging and discharging current is of too high a value that they can reasonably cope with. They heat up and disintegrate. In such case, give each of them a few tens of ohms series connected snubber resistors to limit their charge and discharge currents. Similar may apply to C29, C31, C32.